Due to the delicate location of the 2200 sq. meter yard in the entrance to the new neighbourhood in Ruurlo and the historical monumental farm behind the location, the municipality has announced an architectural competition. 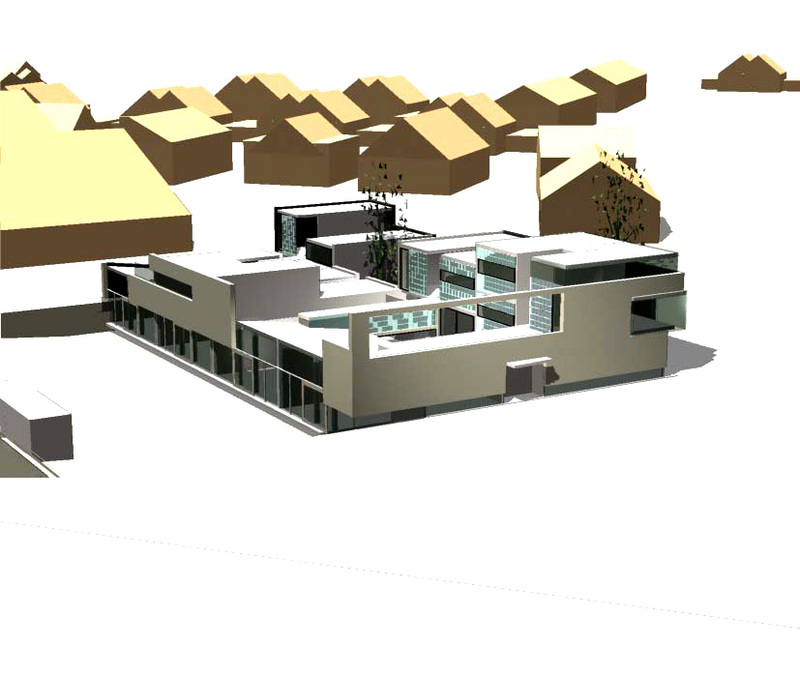 This scheme is based on the ambiguity of the location; on one hand it is a sequence of large objects on the edge of the neighbourhood and on the other hand it is a part of the neighbourhood of one family house. The building is set back from the street to open the view for the historical farm. The ground floor has been partly lowered one meter under street level while the higher levels have been fragmented to elaborate the scale of the farm’s roof and to fit in the structure one of the family homes it faces. The elevation which faces the entrance road to the neighbourhood has been designed as a big frame (with a ‘glass’ volume popping out of it) that marks that entrance but does not block the view. At the same time this provides intimacy to the balconies of the dwellings behind it. The urban and architectonic design is a play between building and landscape, which has a variety of green areas (public, private, balconies, patio’s and green roofs) with(in) the built environment. 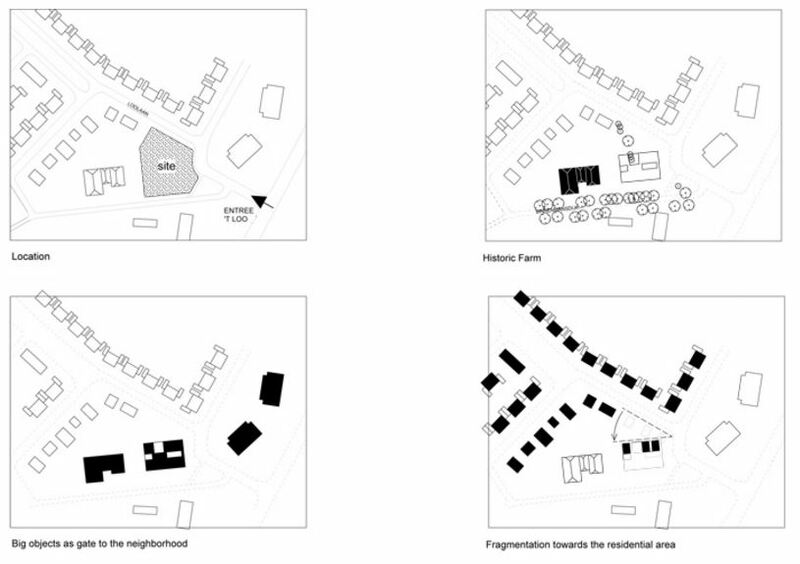 The project includes four different attached dwellings which together becomes one big ‘villa’ in the landscape. The advantage of this compact scheme leads to efficiency because the remaining open green area can be used more resourcefully then if it would be used to separate the dwellings from each other. The living area of each dwelling includes two levels with a one meter height difference between them and a maximum height of four meters which gives a diverse space and multiple possibilities of use. The patio creates a visual division between the living and working area of each dwelling while letting light enter into all parts of the dwelling. Facilities such as a garbage area, post boxes, (wood) storage and bicycle parking has been designed as a one ‘wooden’ fence which gives the gardens privacy from the read. The materials have been used and detailed in such a way that they anchor the modern building in its rural surrounding by using dark stone typical of the dark coloured farms of this region.